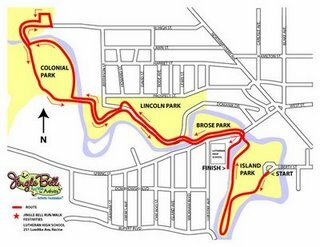 As most of you know this weeks run will be the Jingle Bell Run (see map below for the course). Andy is looking for one person to volunteer to do some setup and take-down before and after the event. They need to show up around 6:00 to help. He’s also in need of three people (non-participants) to call out times as runners pass certain markers.